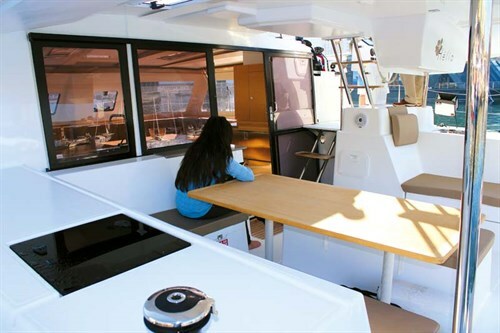 The Fountaine Pajot Helia 44 sailing cat boasts two decks, living space to rival a 60-foot monohull and a keen ability to windward. The big three sailing catamaran builders – Fountaine Pajot, Robertson & Caine, and Lagoon – are pushing hard for your dollar right now. 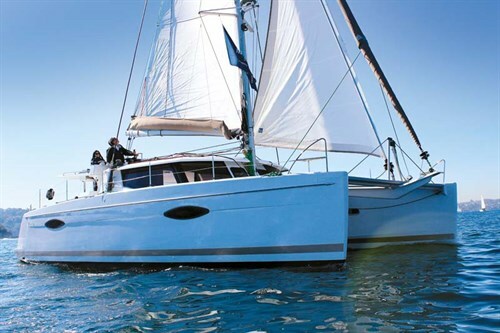 And thanks to mass production and economies of scale, these big boys are delivering increasingly better boats at sharp prices, as typified by the Fountaine Pajot Helia 44 sailing cat. 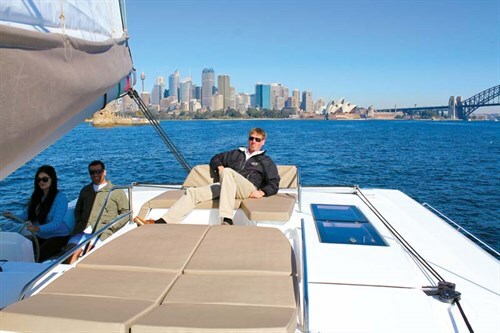 Reflecting the worldwide popularity of this model – 117 of the Fountaine Pajot Helia 44 have sold since its introduction in 2012 – there’s already been eight supplied in Australia. Stepping aboard hull number 48 in Sydney’s Darling Harbour, the styling and feel was reminiscent of the flagship Sanya 57 that I sailed previously – not surprising as the prolific French design house of Berret-Racoupeau has been responsible for both boats. Wide steps from the aft deck lead to the starboard helm station where the sail controls are separated from the helm by a walkway. The downside of this unusual arrangement is inconvenience for a shorthanded skipper whose best way of trimming would involve setting the Garmin autopilot before leaving the helm. But the upside is ample room to work the Harken genoa winches, while the halyards are also near the mast and managed by a single electric Harken. Another plus here are the bins that help stop the passageway becoming strewn with lines. Behind the helm lies the main track which sits at the end of the boom, offering maximum control of the fully battened mainsail. The wide bench seat at the helm means command is not a lonely experience and to avoid the sun a tubular and canvas bimini is available. 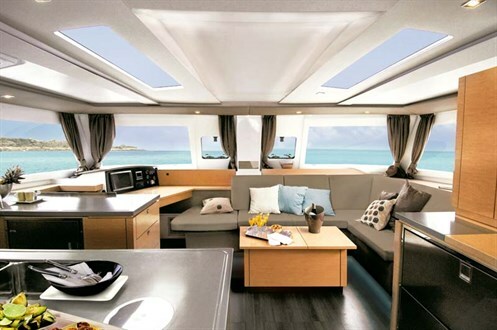 When it comes to choosing the internal layout of catamarans, popular variations often include where the galley goes and how much space is given to the owner. The galley-up style involves sacrificing part of the saloon, while the galley-down invariably takes up sleeping space. For the cruising couple the galley-up is popular because it allows cooking to be done in a more social atmosphere and the meal can conveniently be served to al fresco diners on the aft deck. Clever internal design creates a very liveable space on the Fountaine Pajot Helia 44 with the lounge forward, alongside the spacious chart table, while the galley is spread across the aft part of the saloon. The big improvement over the Orana is a mid-floor bench providing workspace while also supporting the cook in a rough seaway. A three-burner gas stove with separate oven plus optional microwave should cater for most tastes. Another bonus on the Helia 44 is the ability to transform the saloon table into a daybed via adjustable table legs – a worthwhile option on our test boat. Our review Fountaine Pajot Helia 44 was the three-cabin Maestro version that devotes the entire starboard hull to a spacious owner’s stateroom, sealed by a sliding door. 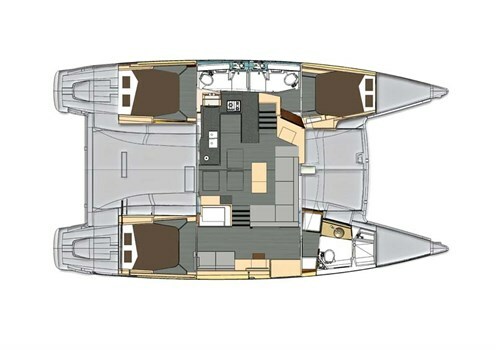 For chartering, the four-berth version has identical hull layouts with slightly larger aft cabins in each. 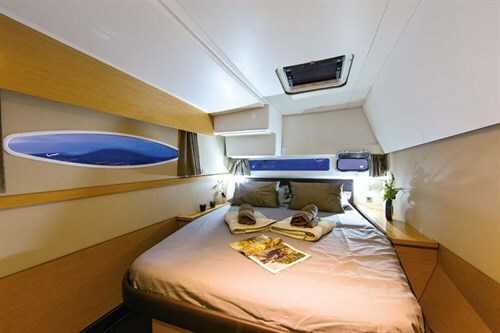 Stepping down into the starboard owner’s cabin brings you to a very comfortable space with towering headroom and lit by two large oval portlights and several opening skylights, so ventilation is also good, even without air-con. There’s also a view aft, thanks to a rectangular window over the large island bed, plus an opening porthole for breeze at anchor. Climbing across to the guest accommodation in the port hull brings you into an equally comfortable area with spacious double beds in each, alongside twin en suite bathrooms. The nervous catamaran sailor may choose the forward bunk as it contains the escape hatch, obligatory on all larger multihulls sold in Europe and definitely advisable for any offshore sailing. The hardtop GRP coachroof extends over the aft deck to create a sheltered outside dining area and Multihull Solutions can fit clear plastic screens to seal off the entire area if required. The single-level lounge deck has space for eight to dine at the teak table to port plus a single bench opposite with a large storage box beneath. There’s also another fridge – ideal for sundowners. Another good design feature is the transom walkway, allowing crew to move about without disturbing those lounging on the aft deck benches. Water access is also easy with moulded steps on both hulls and launching the tender from the davits proved simple, when I used it as a photo boat. There is also ample clearance between the dinghy and the water for sailing offshore. Moving around on the flat decks of the Fountaine Pajot Helia 44 is done easily thanks to flush hatches, but hand support could be better. Full-length coach roof rails would be preferred on a bluewater catamaran rather than the short length found on the port side only. Cleating is adequate, including midships, while at the bow a Quick 1500W vertical electric windlass is housed in the port locker with plenty of space for chain. Berret-Racoupeau has created tall, upright hulls which give sufficient bridgedeck clearance to avoid wave slap, the bane of many catamarans. The underside flows smoothly to minimise resistance, while long mini keels reduce leeway and allow the hulls to dry out. The La Rochelle-based yard uses the latest technology, so the hulls of the Helia are vacuum-bagged solid fibreglass below the waterline and balsa-cored sandwich above, which means they will withstand a knock while providing insulation inside the living quarters. The deck is infused GRP that saves on weight while giving structure, and the quality of the finish was excellent throughout. Lateral rigidity is paramount on a catamaran, so the company wisely chose to mould the bridgedeck and saloon in a single structure using injection moulding. Hull space around the engines is plentiful for servicing the 55hp Volvo Penta saildrives, while the standard models are 40hp. Motoring away from the confines of Darling Harbour, I opened the twin Volvos coming out onto Sydney Harbour reaching 9.2kts as the 55hp saildrives spun the three-blade folding props at 2900rpm. Beyond the Harbour Bridge, we encountered a light breeze of 10kts – not the ideal conditions to sail a large catamaran with lots of wetted area. But a lack of swell allowed the Helia to build some momentum under genoa and mainsail, moving us along at 6.2kts on a beam reach. From the comfy double helm seat the clear views forward and all around gave me the confidence for any tight manoeuvring – often a problem with larger catamarans – and also allowed me to sail the boat well, thanks to clear sight of the genoa telltales. Wishing to change my point of sail I asked my host Condor – who was standing ahead of me in the helm station corridor – to tighten the sheets while I steered the Helia up to the wind at 40-degrees with the Garmin plotter showing 5.1kts. 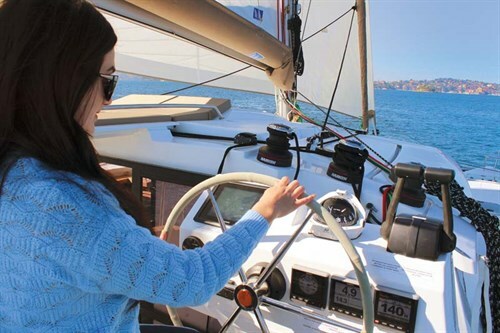 Conveniently, all sheets run to the helm station, apart from the portside screecher, so tacking is easily done – just keep your speed up on a catamaran in light conditions and steer it through the wind steadily. Alongside me sat one of our two guests for the day, Irish-born Georgina – a complete newcomer to sailing – and her partner Ty who were buying a Fountaine Pajot Saba 50. With some encouragement from me she took the helm. After adjusting to the slow response of the wheel, Georgina settled in well and even enjoyed steering through several tacks and a gybe. "It’s not as hard as I thought, but a lot slower than our motorboat," she laughed. A wind of 10kts is ideal for novice sailors but more seasoned owners would be reaching for the Volvo throttles. We had the optional screecher, so I stepped down on the wide deck to unjam its furling line as Condor ran the port sheet over to the helm station while I furled the genoa. Unfurling the larger headsail gave an immediately different feel to the Fountaine Pajot Helia 44, springing it to life and surging ahead on a beam reach to 6.9kts as we aimed for the clear horizon between Sydney Heads. 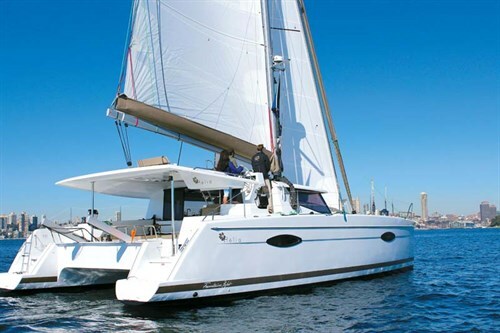 The Fountaine Pajot Helia 44 is a great example of why sailing catamarans are increasing in popularity. The Helia 44 has acres of deck space in a modern design that performs on all points of sail, while giving apartment-style living to rival larger motorboats, sans the horrendous fuel bills.